I’d misunderstood the backcover blurb of this book by Jennifer Spence so thought it was going to predominantly be historical fiction, flashing back and forth in time to a point at which someone made a decision they later regretted or that could have gone two ways. I’m not a fan of historical fiction. I had visions of war-time London or similar and was worried this book might be heavy-going. Of course it helps that a time-slip of 20 years – which is the case in this novel – only takes us back from its present (the book kicks off in 2017) to 1997, which kinda feels like just yesterday. So this book was not at all what I expected. I’m perhaps giving away part of the plot here, but essentially Stella finds herself back in time, giving her the chance to change devastating things she knows will happen in the near future. I commented elsewhere on the ‘Sliding Doors’ scenario and this is very much the case here. Everything about this novel is incredibly clever. I’ve been binge-watching Dr Who (2005-2018) and am now very familiar with the intricacies of time travel ( 😉 ) and the concern of paradoxes (cause and effect); and Stella breaks ALL of the rules here. On one hand she knows that her words and actions could impact on the future and that she shouldn’t interfere, but on the other, there are events in her life she most certainly wants to change. I know it’s very confusing but the old butterfly flaps its wings thing means change can be compounded quite dramatically – in ways that can surprise us. And of course the negatives can sometimes outweigh the positives and / or not be seen for years later. A change to one event in someone’s timeline completely shifts things and Spence deals with that very cleverly. So… intervening doesn’t always make things better and the way Spence writes about Stella’s journey (Stella x 2, I guess I mean) is quite confronting for we readers, as we can’t do anything about what’s happening. I can’t say too much, but the fact that we’re in Stella’s head and reading her journal entries mean we know what happened. What was supposed to happen. And what does happen. And what – as a result of that – happens. So… now that I’ve given away the underlying plot, I should mention the highlight of this book (for me) was how Spence has Stella deal with changes to those pivotal moments and how they play out. The truth and the not-truth (lies seems to harsh a word) become murky and even Stella isn’t always sure what’s real and what isn’t. So though we think we know what’s going to happen, we don’t (in fact) know what direction the book (or the lives of those impacted) will take. As in the other clever book I read recently (also about two possible scenarios following one event), Louis & Louise by Julie Cohen, there are lessons about destiny and fate and whether they’re predetermined or not. And – of course – whether it’s right to intervene if given the chance. And of course of interest, is the fact that the time-travelling Stella gets to view her earlier life in retrospect (knowing what she knows now… kinda). I very much enjoyed this inventive and mentally-challenging debut novel and hope it’s well-received and (that) we hear more from Spence. 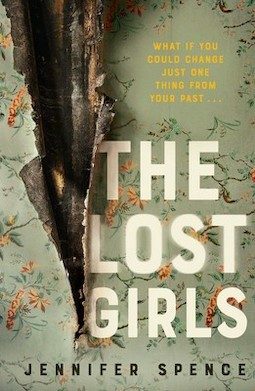 The Lost Girls by Jennifer Spence was published in Australia by Simon & Schuster and is now available.